MWG 90-Rounder Snail Drum Magazine: 90 Rounds of Immediate 5.56mm Firepower for Your M4/M4A1 Carbine (or AR-15 Carbine) | DefenseReview.com (DR): An online tactical technology and military defense technology magazine with particular focus on the latest and greatest tactical firearms news (tactical gun news), tactical gear news and tactical shooting news. DefenseReview has received a lot of positive feedback from professional contacts of ours on the MWG 90 Rounder high-capacity snail drum magazine for AR-15/M16/M4/M4A1-type rifles and carbines. The MWG 90-Rounder holds 90 rounds of 5.56x45mm NATO (5.56mm NATO)/.223 Rem. ammunition, as its name suggests, and would appear to be a much preferred alternative to the Beta C-MAG 100-round double drum mag by the people with whom we’ve spoken. I tested the MWG ninety rounder Sunday and I was impressed with it. I stored the magazine with ammunition for about 3 weeks full and tested it Sunday and it was flawless with the FERFRANS SOAR piston 11.5”. I used the C-MAG before and it was not reliable. This one is. Gary tested it with a magazine full, stored it for about a year and all dusty with no issues, then he hosed it down and filled it up again and no issues. The slight issue is that the magazine is to the left of the rifle and if you are right handed, it will bother you by the joint of the elbow. 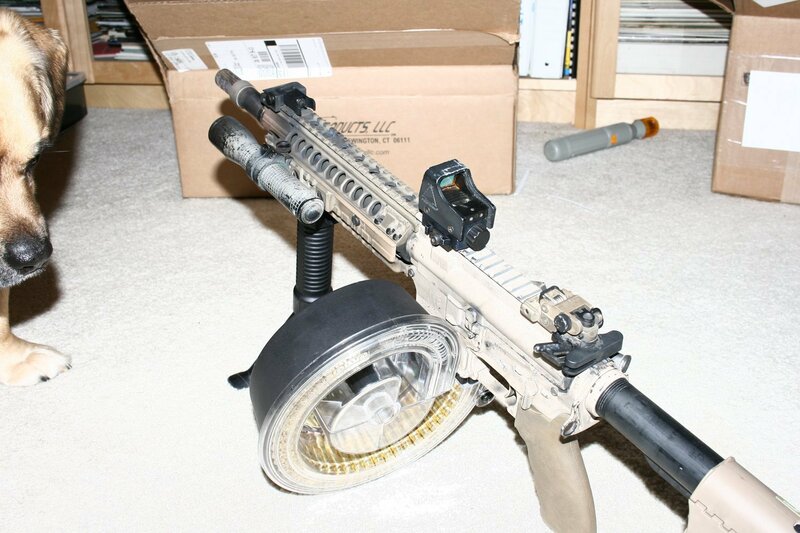 You have to have the vertical foregrip and should be located towards the front of the handguard for it to have a better hold. You can not put your left elbows down while holding the rifle, it should be positioned at a horizontal because the magazine is wide. Anyway, here are some pictures. The photos Ferdie provided to Defense Review are included with this article. We would like to accommodate you but it would very expensive to modify, sorry. Thanks for asking. Hope you’re well. Question: Can you modify the 90-Rounder so that the snail curl goes to the opposite side? In other words, can you reverse the direction of curve? If you can reverse the mag, I think it will make it easier for right-handed shooters to utilize it. It will be more ergonomic when shooting and reloading the weapon. So that, as they say, is that–at least for now. Hey, at least Ned didn’t beat around the bush. Anyway, as my message to Ned stated, it’s my opinion that a rightward snail curve would enhance the 90-Rounder’s utility for righthanders, which comprise the majority of shooters (and warfighters). I therefore think MWG should reverse the direction of the magazine’s curve. For U.S. military use, DefenseReview would recommend that MWG make that modification, and that the military fund the modification expenditure. Lefthanded shooters should be the ones who have to adapt to a rightward snail curve, not the other way around, since they’re in the minority. Field eXpedients: MWG 90-Rounder in Action in AR-15! The MWG 90-Rounder is made from “advanced space age materials” like high-grade polymers (high-tech plastics), and features a translucent polymer backing, which provides a “see-through” window for the operator to monitor his immediate ammo supply in the weapon. It was designed be “completely reliable, and to require little-to-no maintenance at the operator level. To aid in reliability, the 90 Rounder incorporates a pre-installed, permanent layer of silver-gray Teflon lubricant powder, which should never be removed. No other lubrication is necessary, and oil-based lubricants are strictly prohibited. The magazine can be stored partially loaded for extended periods of time, but you should never store it with more than 80 rounds loaded. You should also never load the 90-Rounder with mor than 90 rounds of ammo, as it can damag the springs. Stripper clips can be used to load the 90-Rounder, which comes equipped with a loading chute and plunger for easy and fast loading. DefenseReview would like to test the 90-Rounder for ourselves, so we can write about our own experiences with it. We’ll try to get our hands on a couple of them. Caliber: 5.56x45mm NATO (5.56mm NATO) / .223 Rem. 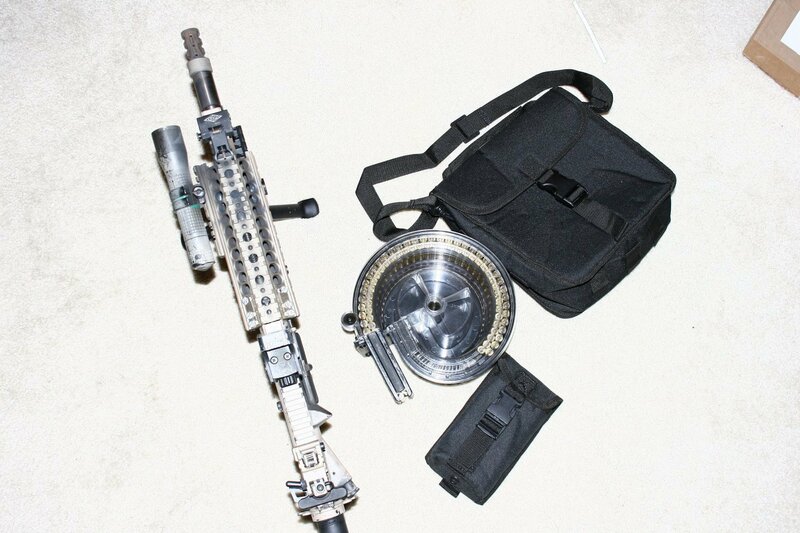 For Use In: The M-16 family of firearms to include: M-16, AR-15, M-231, Port FiRings, etc.